Branches of those serving in public service positions united to give Burlington Township’s youth a taste of what it is like to keep the community safe. What does it mean to be a hero? The participants of the third annual Burlington Township Emergency Services Youth Academy may have discovered the answer. Branches of those serving in public service positions united to give Burlington Township’s youth a taste of what it is like to keep the community safe. For the third year in a row, the academy has provided a week-long course, exposing the ins-and-outs of life as a firefighter, EMS worker and police officer. 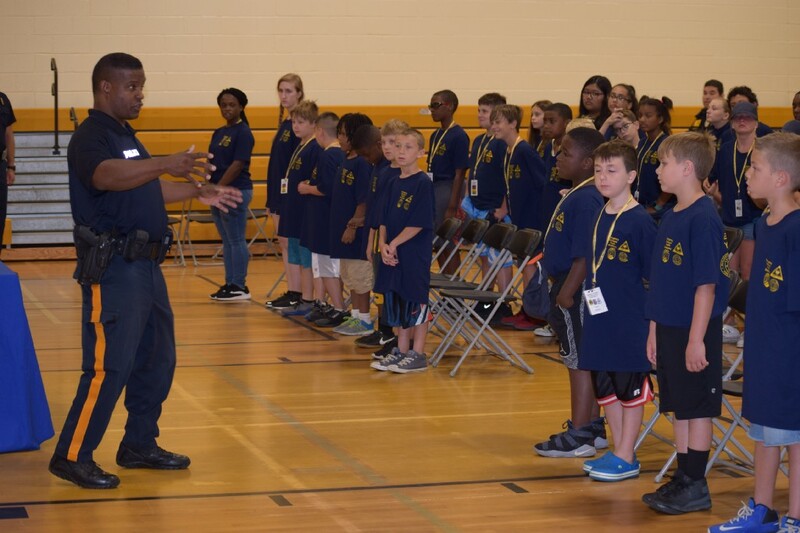 Police officer for nearly two decades and a coordinator for the program, FloydHazzard said the academy is a tool to help others gain perspective about these professions, while exemplifying the collective efforts of each agency in Burlington Township. This year’s program highlighted a variety of topics. Collaborating with three agencies, the academy covers fire safety, bully prevention, gun safety, CPR, bandaging and more. With more than 50 individuals ranging from ages 9 to 13 completing the week-long course on Friday, July 13, Hazzard believes it has made a positive and educational footprint in the community. Fire official and program coordinator Matt Tomaszewski, said that every year evaluations are completed by participants for improvement purposes. From last year’s feedback, an obstacle course was added to better demonstrate how to handle a house fire. Academy coordinators will begin to delve into the evaluations from this year in the coming months to make next year’s academy even better. All together, the academy takes six months of preparation and planning before it transforms into a reality, according to Hazzard. Shirts, food for the kids, transportation and finding a location for the courses all are part of the planning process. Diligent planning is one of the steps in getting the academy up and running every year, and funding is another. Hazzard said the “Alliance grant,” a county grant, funds the program in its entirety. A portion of the grant, which consists of more than $20,000, is used for the academy. “If we didn’t have the grant, we wouldn’t be able to do it,” Hazzard added. Hazzard said the academy has inspired kids to possibly pursue a career in one of these fields, in addition to enlightening young minds about what it means to keep a community out of harm’s way. The participants were excited to talk about their experiences at the academy, including 14- year-old Samtrina Shekpeh. Shekpeh said her knowledge in each of the three fields has expanded, including in fire safety and first aid. “I am definitely coming back here … you learn a lot of things from it,” Shekpeh said. Shekpeh said the academy has also given her the opportunity to develop new friendships she otherwise would not have, because kids of all ages throughout Burlington Township and some surrounding towns participate. Echoing Shekpeh’s sentiments, 11-year-old Ashley Dierling said she has enjoyed learning how to do CPR and put on fire gear on, with her favorite, learning how to perform CPR. Dierling encourages other interested kids to get involved because you will walk away with more than what you walked in knowing. “You make more friends and learn valuable lessons,” Dierling said.